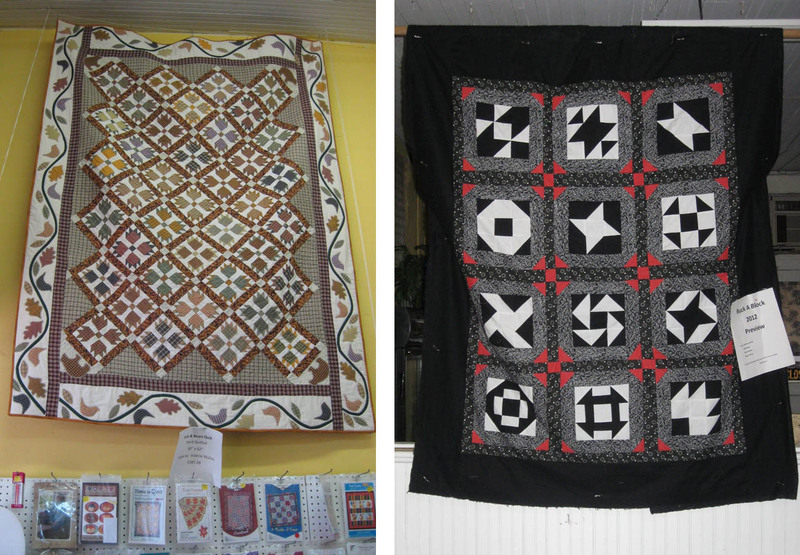 Quilters are passionate about their craft and their art. With that, I think quilters also have an internal fabric-and-thread GPS (or quilters' radar) for scoping out and shopping at quilt shops wherever they may be... urban downtowns, suburban strip malls, small town historic districts and little country cottages nestled amidst fields and pastures. Through my Fabric Rep Trek for Blank Quilting, I have learned to "expect the unexpected" when it comes to the buildings, structures and locations where quilt shops reside. Here are recent visits to quilt shops and fabric shops that dapple the quaint landscape of middle Tennessee. 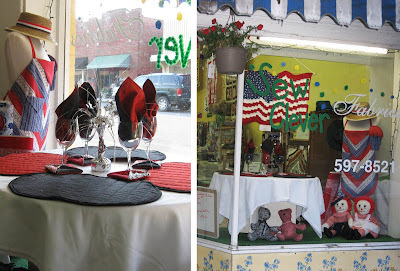 Sew Clever Fabric 'n' More is owned by a delightful young woman, Coral Braswell, who purchased the store about 14 months ago from the previous owner. 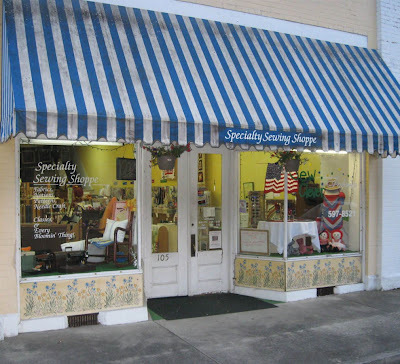 Coral, a recent college grad with an accounting degree, was a new quilter at the time and excited upon finding a quilt shop in her own town (what could be better??). She was immediately disheartened to learn that the owner was retiring and closing the store. After careful consideration, Coral and her husband—who incidentally grew up in the family-owned five and dime in a neighboring building and had always wanted a store of his own—bought it. (Yay! A happy ending and a new beginning for Coral and the shop.) The shop is located at 105 Main Street, right off the town square, in historic downtown Smithville, Tennessee. Splash blender fabrics and other bright and cheery prints. Coral continues to build her fabric inventory, and already has a wonderful collection of Splash blenders, brights, novelty prints, reproductions and traditional prints and some batiks. She's got an eye for color. She has lots of ideas for programs and has offered a successful Block of the Month (BOM) using Thangles. The high ceilings of the shotgun style building allow for displays of large quilts (though, I'm not quite sure how she gets them up there). sampler quilt hung in the shop. 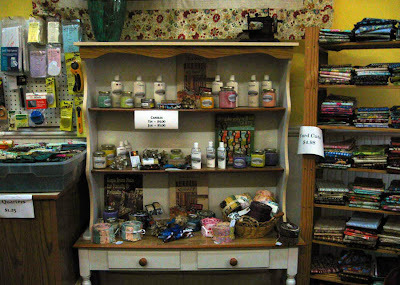 Among the patterns and kits for quilting, supplies for sewing and other needlework activities can be found at the shop. 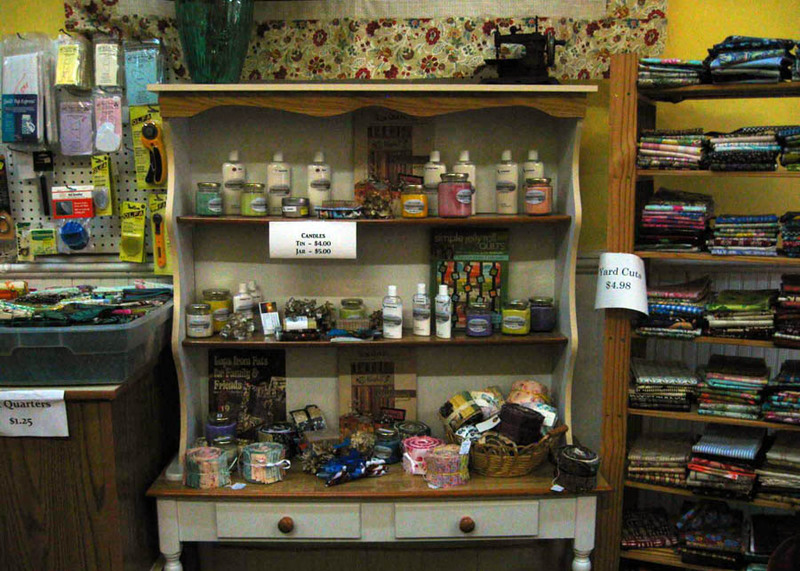 Prior to Coral's ownership, this shop was the local resource for sewing fabrics and notions. 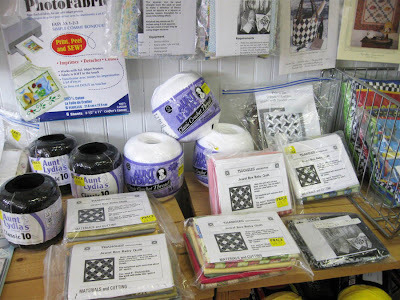 Thangle quilt kits, patterns, and quilting notions along with needlework supplies. Quilting notions, 1 yard flat folds, fabric strips and other quilting gadgets. 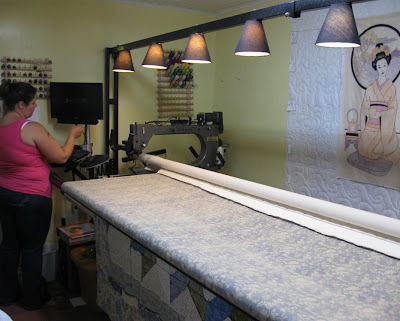 When I arrived, Coral was assisting a quilting friend load a quilt top onto a frame that supported a domestic sewing machine. Coral quilts her own quilts, is a member of TVQA (Tennessee Valley Quilters Association), and was participating as a vendor at this year's Assembly Day. 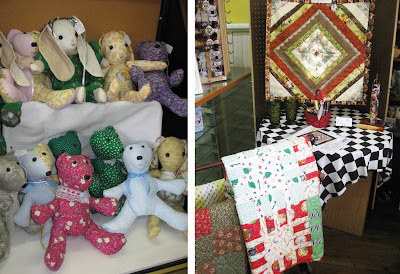 Bunnies, bears and quilts—a perfect combo! Cute and clever window displays at Sew Clever. 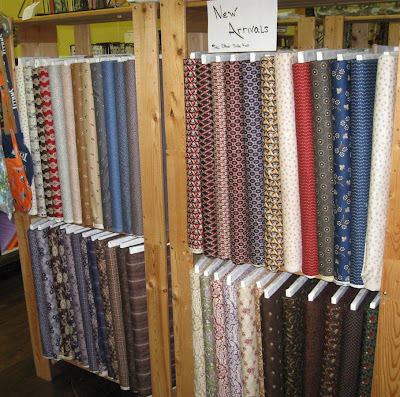 Sew Clever Fabric 'n' More has an old world charm with its high ceilings and hardwood floors and Coral brings new energy into the shop with an infusion of new fabrics and contemporary projects for the modern day quilter. 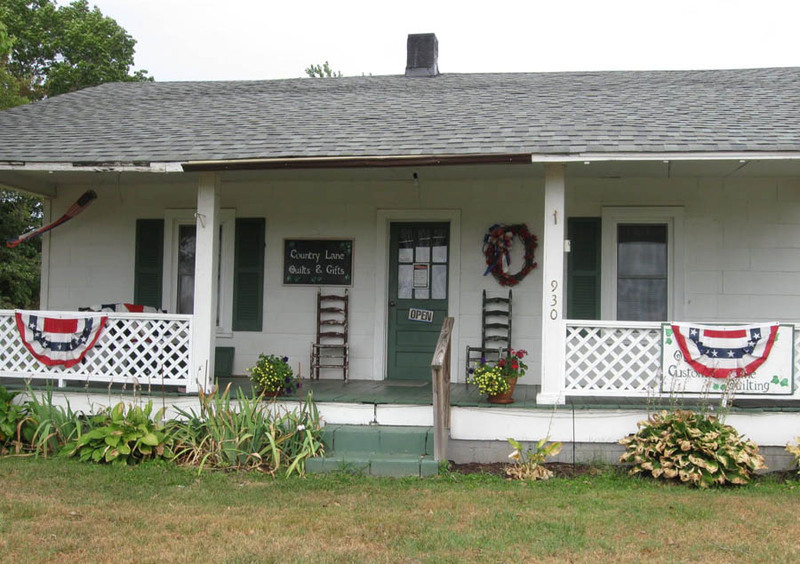 Just outside downtown Smithville, about 7 minutes away in the country, is Country Lane Quilts and Gifts. 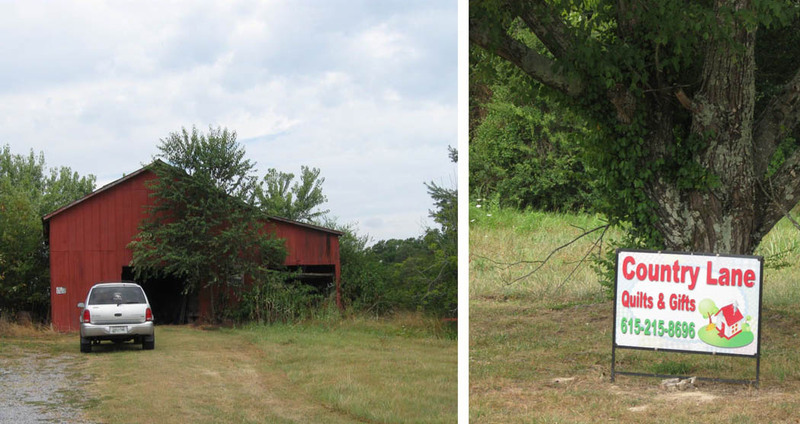 Located near the bend in the road, this little house has more inside than you think. 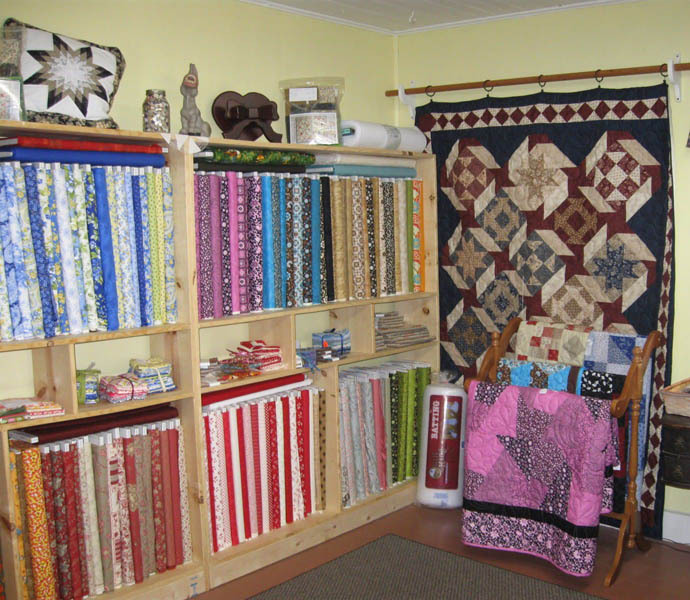 Country Lane Quilts and Gifts in Smithville, Tennessee. 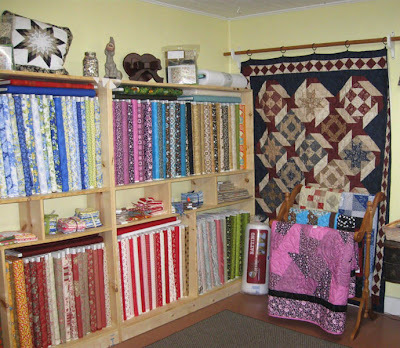 The two main rooms have shelves of fabrics, bundles of fat quarters, baskets of quilt kits and notions and pieced and appliqué quilts displayed on available walls and racks. 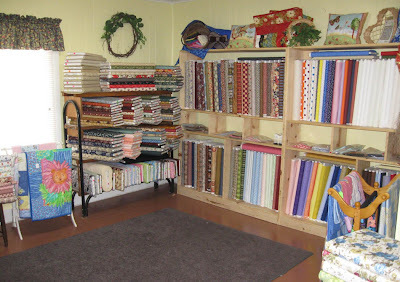 The main room at Country Lane Quilts. 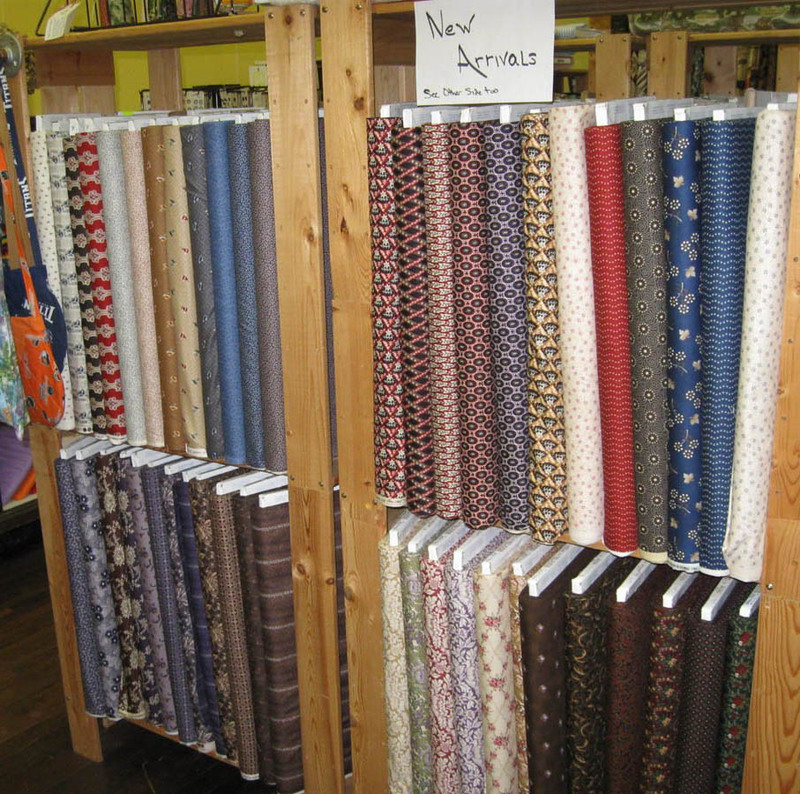 The collection of fabrics is quite diverse: novelties, brights, florals, tone-on-tone neutrals, and more. 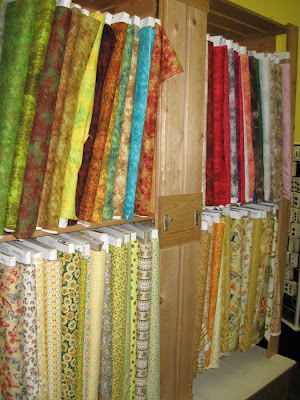 Another room with an assortment of fabrics. 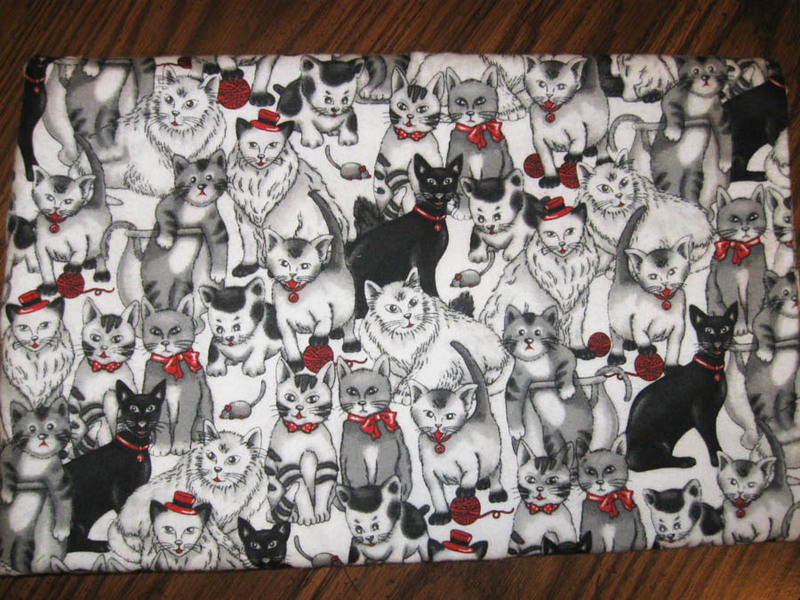 I found this cat-themed flannel. How cute is this? At only $4 a yard, I took home a yard to make something for our little kitty, China. A yard of this kitty fabric came home with me. This whimsical appliquéd flower wall hanging is an obvious ribbon winner. Don't you just love the multi-color rod pocket? A sampler BOM and a ribbon-winning wall hanging made by Sonja. A computerized Gammill long arm machine spans one room (probably the house's original dining room). 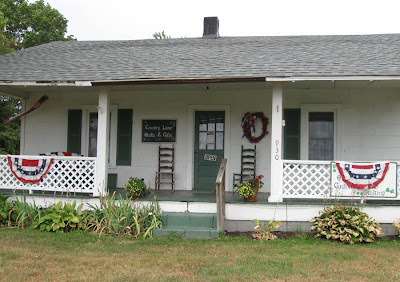 The shop offers machine quilting services and two of the owners, Kathy and Sonja mentioned they had even taken orders from customers as far away as New England. Sonja at the computerized Gammill long arm. 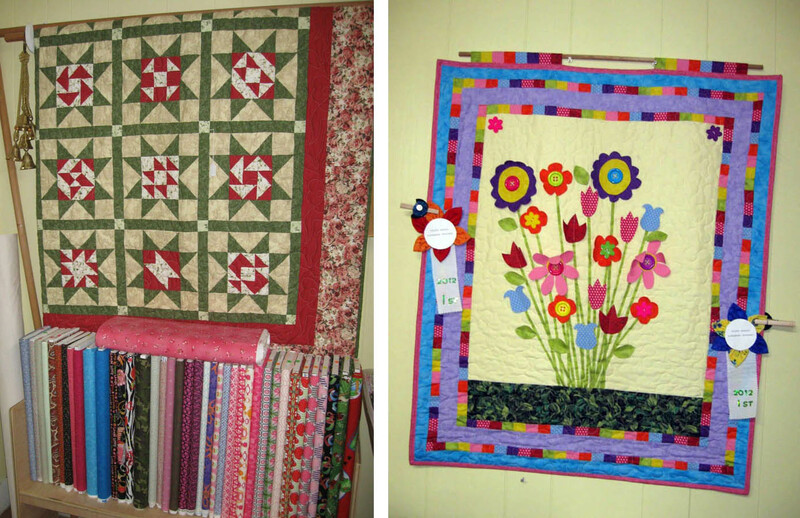 Country Lane Quilts and Gifts has a down home country charm—complete with an old red barn in the backyard. The staff is friendly and helpful and if it weren't for my next appointment 45 minutes away, I could have stayed and talked "machine quilting" with these gracious ladies all afternoon. Country Lane Quilts: turn in and park in front of the old red barn. You never know where you'll find a quilt shop, but wherever it is, the owners and staff are just good quilting friends you haven't met yet! Go out and visit your new friends. It is so much fun to follow your trek! It gives me ideas of Day Trips with my buddies. Oh, do take a day trip. From Chattanooga, going to these places is quite do-able!